Animateducated: An Adventure in Advertising! 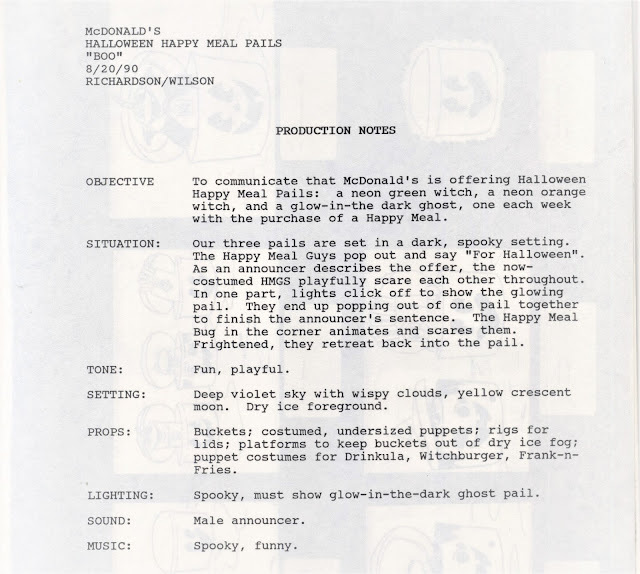 I thought I would walk you through the production process of a McDonald's commercial that I worked on at Leo Burnett USA, after graduating from Columbia College in Chicago. 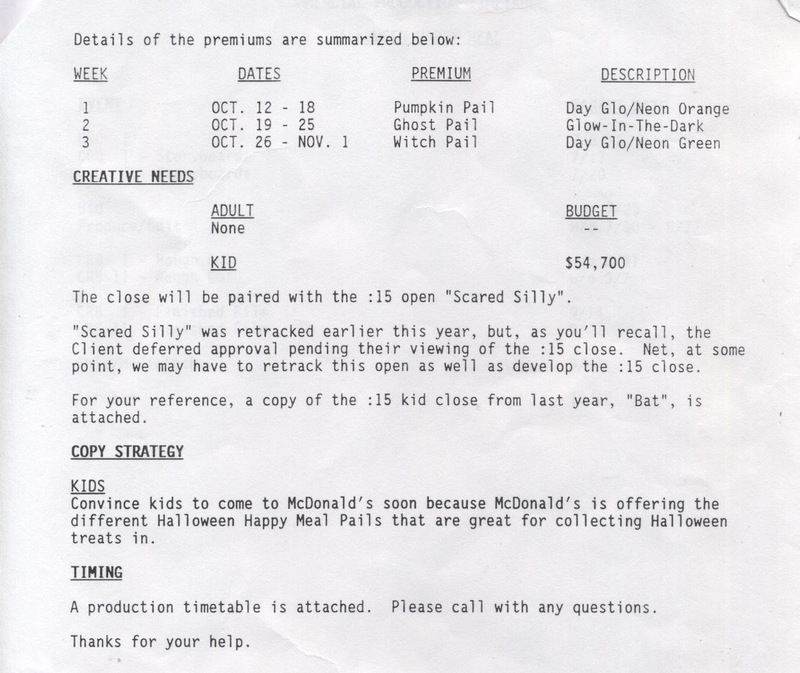 Here's a copy of the finished Halloween Pails :15 spot I worked on. I remember knowing about the McDonald's Halloween Happy Meal pails back when I was in High School and later in life, my first commercial assignment was to come up with a :15 spot to sell them to the public in a clever way. 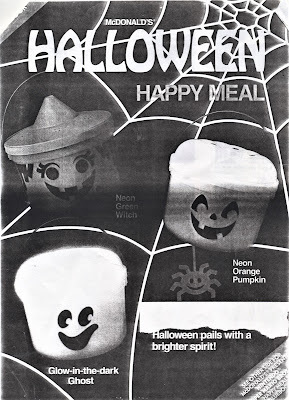 In this spot, we also had to stress the "Glow in the Dark" ghost happy meal pail as well as other things in the :15 second spot. In 1989, a :15 closing spot featured a cute Bat puppet who flies through the scene and tells you about the products was made. Here is the photo storyboard of the finished spot and the only thing I could find that exists that shows how the finished spot turned out. 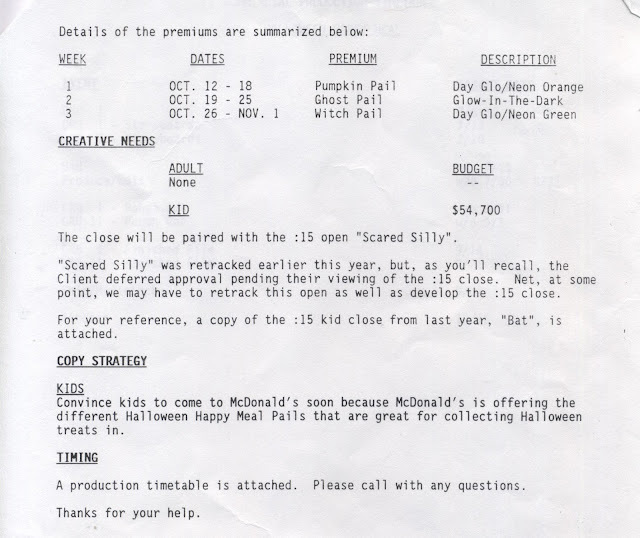 I first got the assignment back early June in 1990, where my Creative Director, Joe DeVivo introduced me to the assignment and paired me up with a young copywriter named John Wilson. Our task was to come up with several ideas for the :15 spot and then pitch them to Joe in a week or two. I forgot what other ideas we had came up with, maybe another one using the same Bat puppet. After the pitch, it was determined that the Happy Meal characters scaring each other would be the best idea to board up officially. Now again, this was a while ago, so there might have been a few other ideas that we pitched to our group for feedback and revisions. And to save you all the back and forth time revising the boards, I will skip to the point where we pitched the final board in the agency and got a green light. 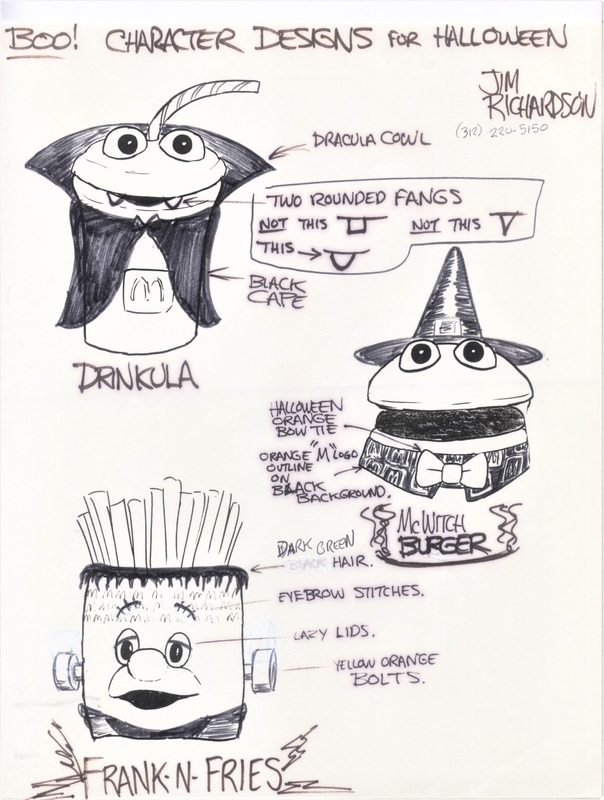 The Agency reviews all their work internally before pitching the ideas to McDonald's. There were several other boards taken out to the client and the ones that were sold were given the green light to produce them into final TV spots. Here was the production timetable. Here are the final boards that were pitched and sold. 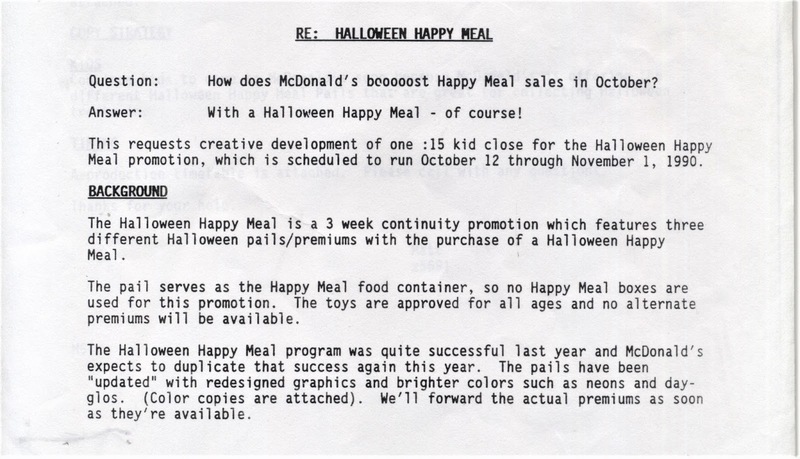 The Happy Meal characters are in Halloween costumes and are jumping out of different pails. 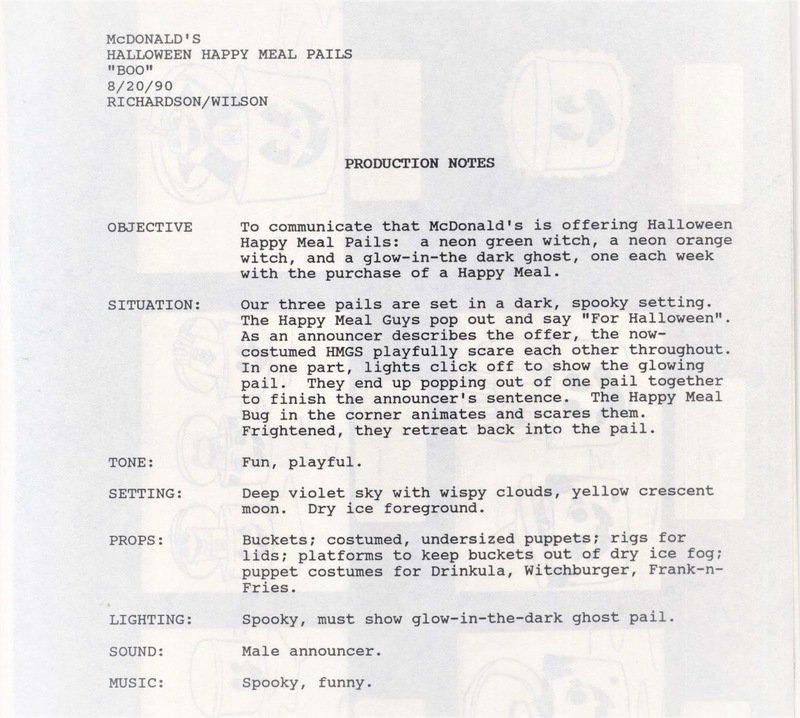 In the end, the all pop out of the middle pail and the Happy Meal logo, also known as a bug, animates and scares the characters back into the pail. When the boards were sold and producer was brought on to go over all the details that we had to shoot. As this process went forward, I discovered a whole new world called "Legal" which I never knew existed. This is were all the legal issues pop up and must be addressed or else the commercial you are shooting might not be allowed on the TV networks. While I was doing the art direction for the spot, John was timing out his dialogue, finalizing the script and production notes. During this process, we discovered that we had to have less then 8 seconds of the puppets on the screen. Legal determined that viewers would assume that the puppets would come with the pails since they are on the screen at the same time. 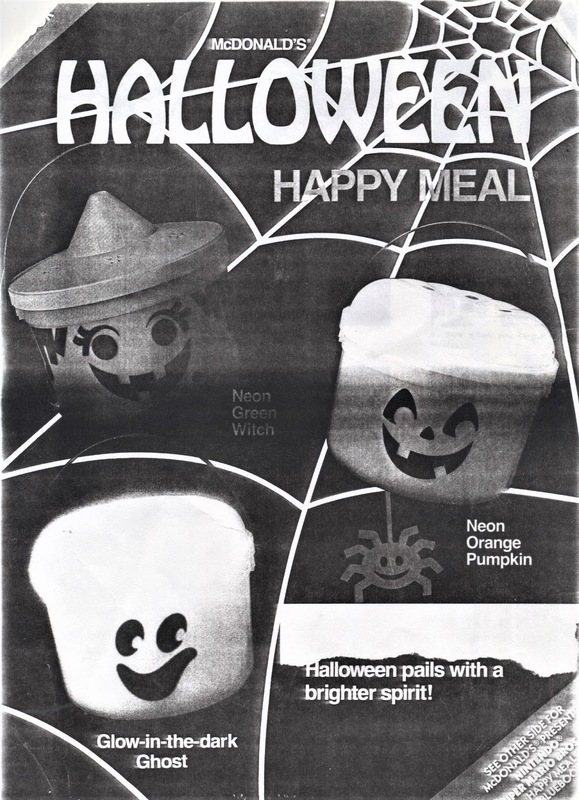 Also the "Glow in the Dark" had to glow in the dark on the film. 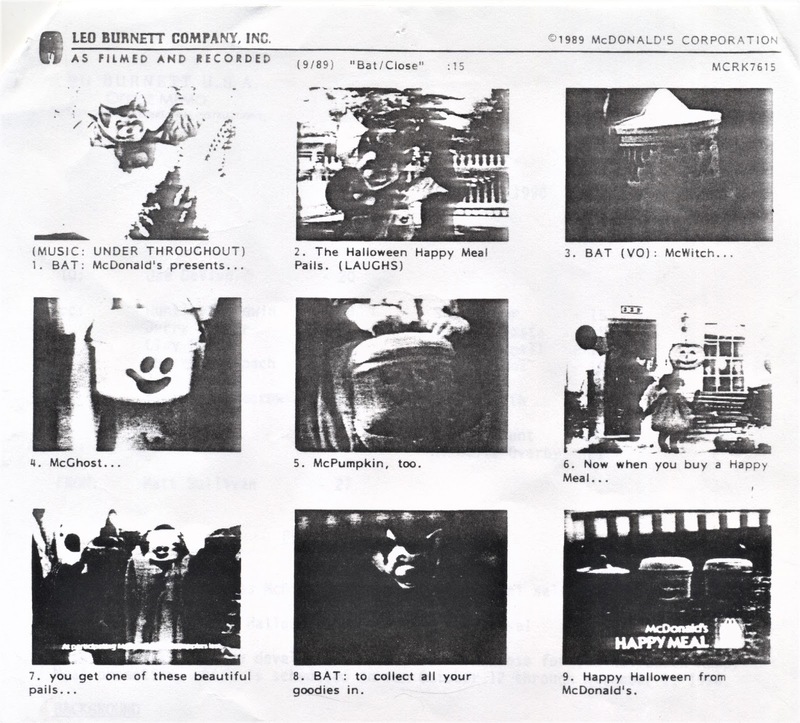 Back then, all commercials were shot on film and transferred and edited onto videotape. 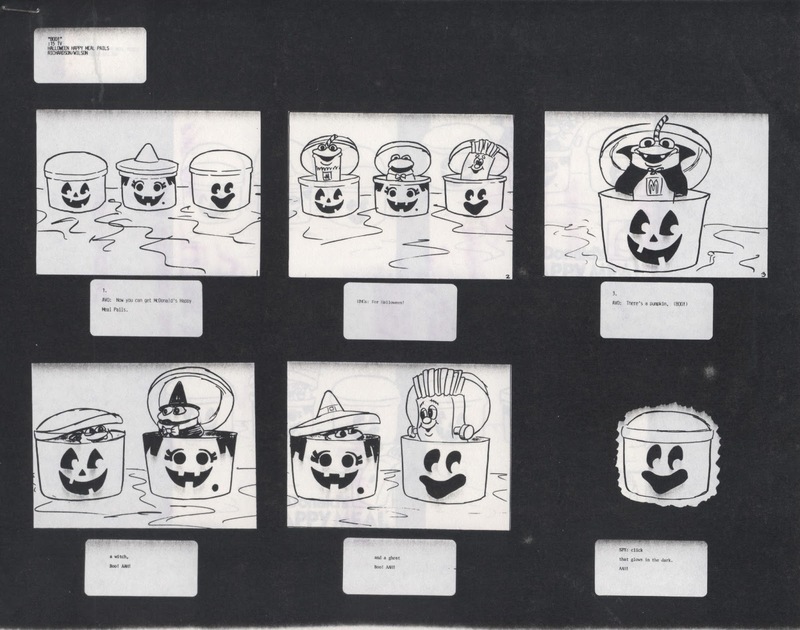 No cameras at that time could shoot the "Glowing" pail without UV lighting. Legal demanded to see the "glow in the dark" shot and then would approved the glowing enhancement later on. The production notes were given to the network lawyers to review and then they gave us notes if something wasn't allowed or was missing. 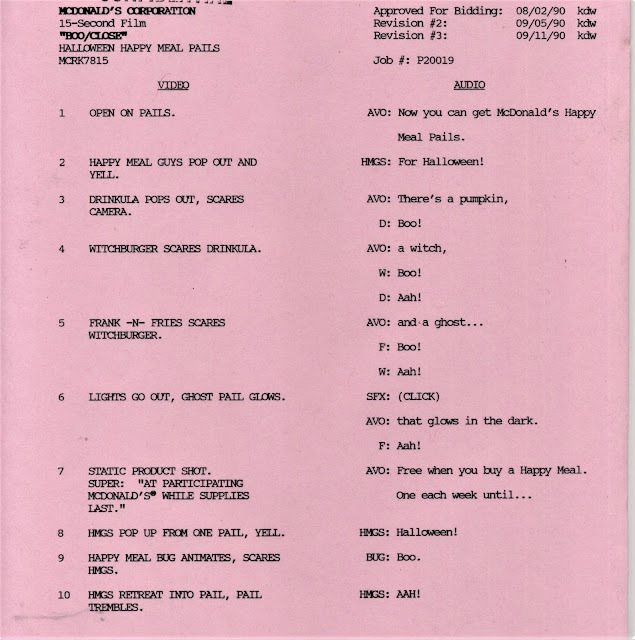 This was sent out with the storyboards to studios for the bidding process. Other legal issues popped up! There might be a problem with the McDonald's Happy Meal bug animating to react with puppet characters on set. Legal then said, Animation characters pitching products is not allowed. What?! The Leo Burnett lawyers sent dozens of animated spots featuring animated characters pitching products. What is animation? Are the puppets considered animation? The bug would be an animation character. 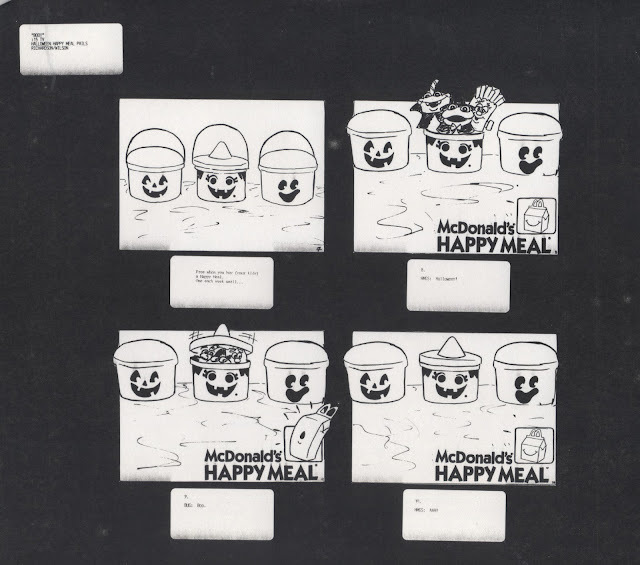 BTW, the Happy Meal box logo was never animated before, here's one from 1996, after my spot. I also pushed a local animation company called "Calabash Animation" to be considered for bidding on the McD bug logo. The Producer, who had years more experience than me, wanted to give the job their usual LA studios and didn't want me to give Calabash the job. Calabash was just starting out, but could easily handle the animation of the logo since I had worked with them in the past. The Producer finally gave them the job, but told me if anything screwed up, it was on my head. So much for helping out local studios. I got to fly with a group of Burnett pros to LA for the 2 day shoot. They shot the "Glow in the Dark" in natural lighting for legal and we even had the spooky fog on the set. There was a lot of popping out the puppets and popping them back into the pail as fast as possible. It was a long day of shooting but everything worked. Calabash did several pencil tests and the animation was approved. The logo was cel painted and the final version was added to the edit of the spot. The editor was able to remove frames to speed up the cut and keep everything under the time limit. Finally when it was all done and the final spot was sent to Legal and the networks for final approval. To our surprise, one ABC executive came back from a bad lunch experience and would not approve the spot. The brief mentioned "spooky fog" and he thought it was more "mystical fog" than spooky. The legal team of Leo Burnett were once again on the phone and finally the executive agreed and gave his final approval. So there you have it. I've had this items in a box for years waiting for a way to tell the tale of my first adventure in advertising. I hope you learned something from this and as always would appreciate any comments or feedback. Unless you're that same ABC executive.